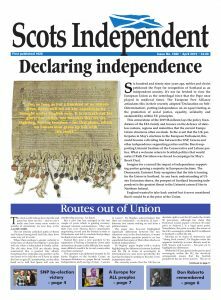 Since 1926 the Scots Independent has been the only regularly produced publication that fully supports the cause of Independence. It has always been produced and distributed by volunteers. This remains the case today with everyone involved living in different parts of the country. So long as there are willing volunteers the newspaper and the website will continue. Our remit is not to make great proits for our masters but to help spread the pro independence arguements to the people of Scotland, and further afield.